Weekly Mystic Monday card reading below. Special notification : Starting next Monday,the Mystic Monday weekly card reading will be changing in format to a single card each week. 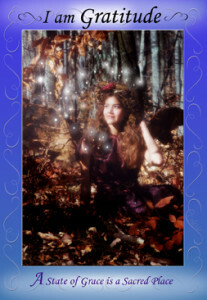 This is to allow me to do more with the weekly card readings including adding a quote from the guidebook and to post the suggested practice segment from the booklet as a reminder on how to best use that card for the week. 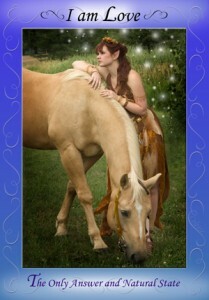 in the new Mystic Muse newsletter available by emailed only to our subscribers. Edition 1, which will also contain exciting news about the new deck, tips and special notifications, to be released September 15th 2015. Register now to not miss a single issue. A wonderful spread for the start of this lovely week. 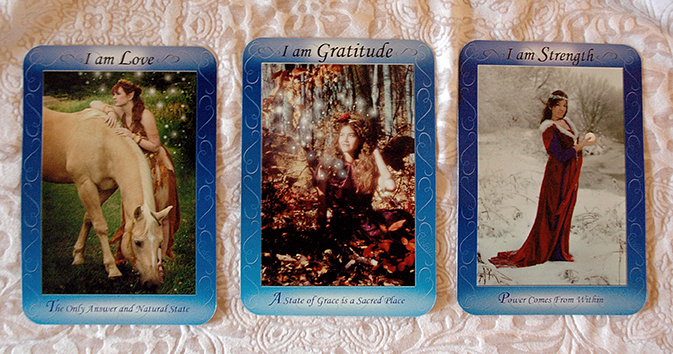 These are 3 of my favorite cards in the Bliss deck and seeing them together makes me smile especially because of the message these hold for us. I stand by the statement that love is what is natural. When you love yourself then all is clear. Less energy is spent on what others think and you remember to take care of yourself. This works well in conjunction with the second and third cards but very powerful in it’s own right. Being gentle with self and those around helps balance things even in times of shifts and challenges. You can not control how others feel or react but you have control of your feelings. Isn’t gentleness and love a better option to fear and frustration that irritates. When you breath in love as you tackle a tough job or face a challenge everything works more smoothly. When in a state of softness that is possible when you come from the heart it is quite easy to adopt gratefulness into your routine and perspective. To my understanding, gratitude is part of a healthy mind set and it is not necessary that everything in your life is perfect to be grateful for what is already yours. Even less than positive past experiences are to be reflected upon with gratitude due to the learning and growth that too place during those times. It has been my habit of late, although not always easy, to practice gratitude even when things do not turn out quite as hoped for. It just seems to make facing challenges and disappointments on outcomes much easier to handle. Practicing being in your heart to allow yourself the grace of a loving attitude and finding gratitude in every day is very powerful. These practices have offered me and many others in my circle an opportunity to find a deep strength and confidence in the choices made in our lives. Money and fame are not what makes us strong… being strong can allow us to gain these things however it is an inner strength and being aware of that strength that is the needed foundation to succeed. As stated at the start of this write up, these 3 cards work so amazingly well together in my opinion and make a great general message suitable for all about a healthy way of being and thinking.